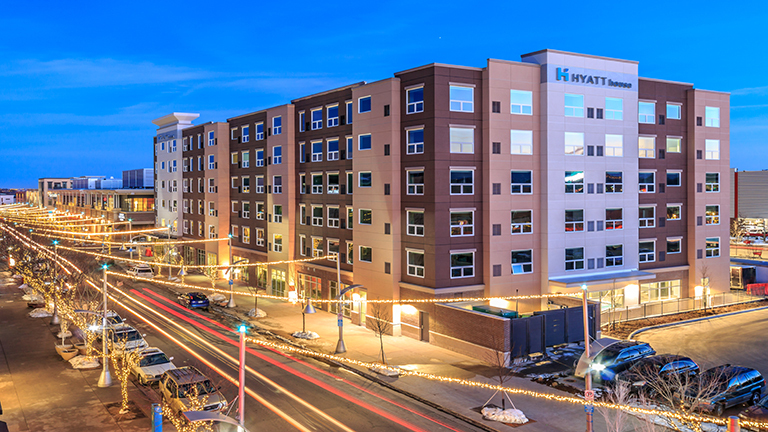 Continuum Partners added a $22.9 million extended-stay Hyatt House hotel to its award winning Belmar neighborhood. This six-story, 135-room, upscale hotel is in the heart of Belmar’s restaurants, shops, offices, 21-screen cinema and Whole Foods Market. Hyatt House has built its brand on the practice of treating people more like residents than guests. And it’s made Hyatt House the number one extended-stay hotel in Business Travel News. Featuring contemporary, residential-inspired studios, one- and two-bedroom kitchen suites and den guestrooms, Hyatt House properties feel like upscale apartment communities. Each offers a full bar, light-fare menu, meeting space, a 24-hour fitness center, a swimming pool and billiards tables, as well as an outdoor gathering space with fire pits and barbecue grills.